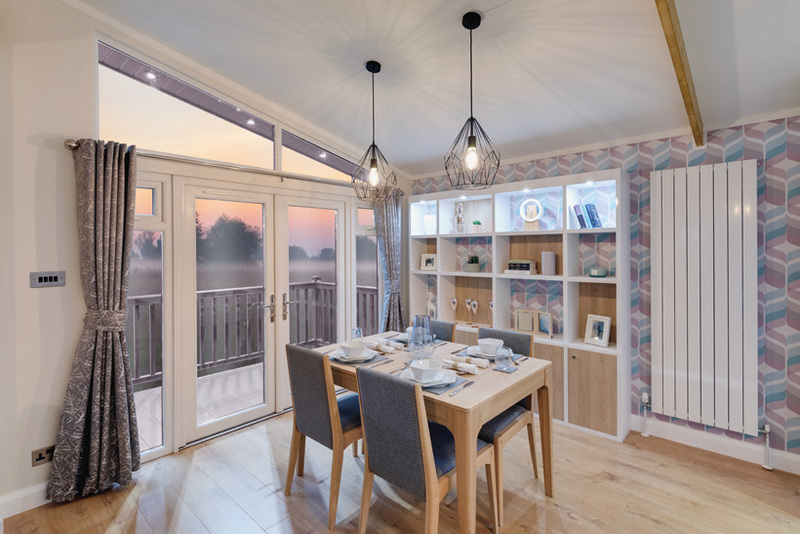 With a focus on living and sleeping spaces, the Rowan has been designed to accommodate both holidays and longer occupancies and has a distinctive look and feel, both inside and out. 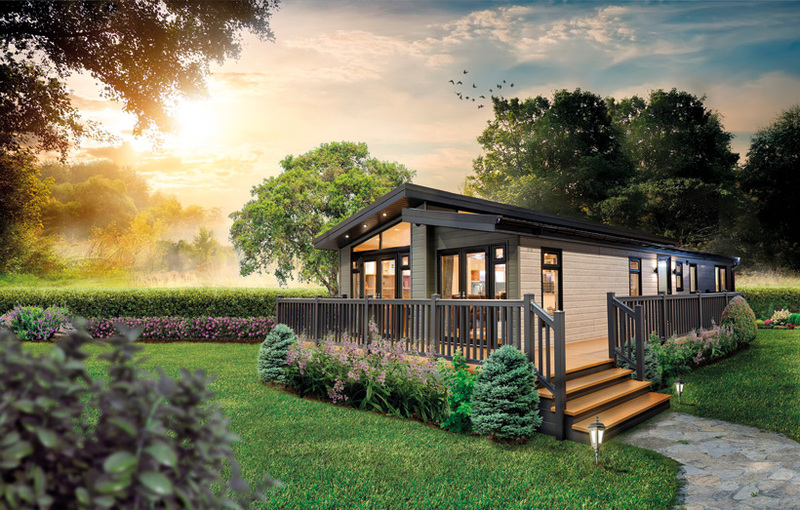 The model shown here is a 45ft x 20 but the beauty about their bespoke lodges is that you can customise them to suit your requirements or the size of the plot available. The design is fully flexible even down to potentially moving walls, incorporating a split-level roof as shown here and bespoke feature windows bringing in daylight and adding a contemporary exterior feel on parks. 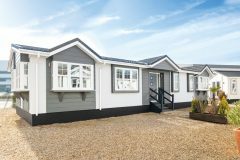 Distinctive and spacious, the two-bedroomed Rowan packs a powerful punch practically and visually with this choice of interior design, and the master bedroom is a massive plus point bound to woo any potential buyer. In this version the side entrance takes you into a utility area, then on into the open plan living area. 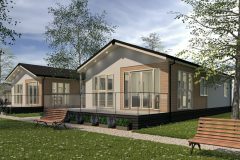 At the other end of the Rowan, there’s a double bedroom, family bathroom and the large master suite, complete with extensive storage and en suite shower room. 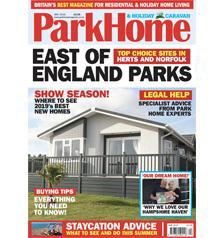 We’ve also taken a look at the 45 x 20 three-bedroom floorplan, and the main change there is that the dressing and storage area to the master bedroom makes way for a bedroom shuffle to add a twin-bedded room. From the utility you step out into the open plan living area, and this is the first of two pretty big ‘wow’ moments. Striking feature wallpaper on the dividing wall to one side of the kitchen offers immediate impact here, boldly heralding the colourways which continue in the lounge, diner and kitchen. Feature beams add further character from above in natural wood. The stunning high gloss kitchen is the natural centrepiece of the home. Light floods in from not one but two Velux windows, and stylish drop pendant lights illuminate the breakfast bar below. The mirrored splash-back is a contemporary twist that gives the kitchen a unique style. The sink here is made of 80 per cent quartz, designed for heat resistance and durability, so that’s a great feature, and that’s topped with a striking feature tap in matt brown with bronze trim. 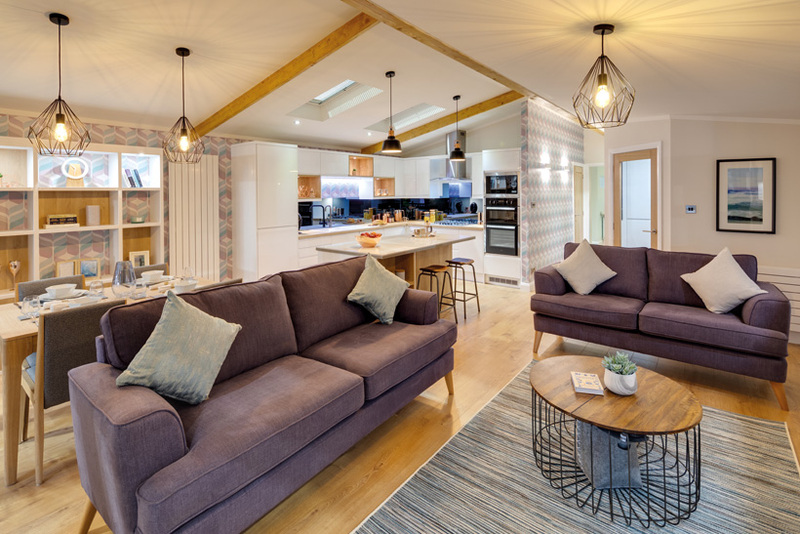 The largest kitchen in the Willerby range, you really are in the lap of luxury here and have plenty of space to potter. The breakfast bar has an integrated wine cooler for those warmer summer months, and it’s the perfect chillout zone to chat to the chef or peruse the papers too. A great range of appliances make it a very practical zone to whip up a masterpiece of a meal. Bronze elements are picked up beautifully in the soft lighting boxes in three open cabinet spaces.